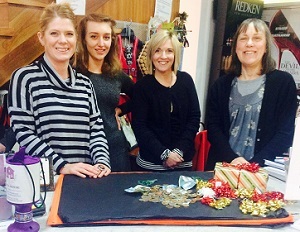 Over Christmas ladies’ fashion and beauty salon Maya Maya, in Wainwright’s Yard, ran a wrapping service with a difference – for donations to Manna House. Our Benefits Officer, Angela (right), went to pick up the proceeds yesterday and it’s been such a success that they’ve kindly offered to gift wrap for us all year round. Thank you, Maya Maya!